During the preholiday season Ucom has updated the mobile TV “MediaRoom” application. In particular, as a result of the application update, users will first notice the new look, i.e. the modified icons and pages of the application. As an update result, the user registration, identification and password recovery possibilities were introduced. The player has been improved both for portrait and landscape modes, and its minimize and maximize features were implemented. The applied changes made it possible to preview the video stream in minimized mode. Left menu, as well as the authorization flow for Universal and U!TV subscribers have been improved. The EPG list preview has been ameliorated and the minor bug fixes were done. “A few days ago we have announced the update of the “Ucom” and “U!Pay” applications. We’re now glad that “MediaRoom” users will also benefit from new features of the amended app. 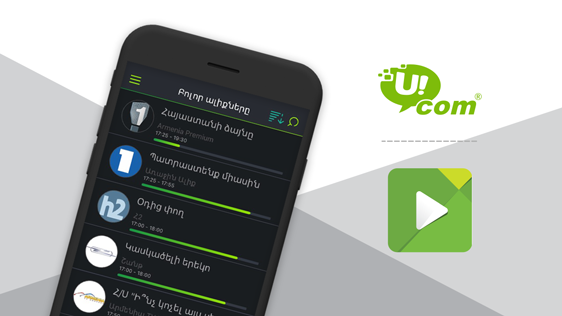 Being a customer-centric company, Ucom assures that this process is definitely continuous”, - said Hayk Yesayan, Director General at Ucom. Let us remind, that the application is available for download both from the App Store via goo.gl/HxqjHT link and Google Play via goo.gl/ZofBxU link.